Peeps, candy eggs, and chocolate bunnies, oh my! How do you do all of the things, yet still save money on Easter baskets and parties? It may take a little planning, but it is possible. Good news, since Easter is on the third Sunday of April this year, there’s still plenty of time. Before you head to the stores, make sure to read this article. You’ll find everything you need to know about spending less on Easter. By far, the easiest way to save money on easter is to plan ahead. Mainly, people overspend when they stop tracking their purchases. Additionally, the cost of Easter skyrockets when purchasing from multiple stores. Each location will have a display of high-demand products in order to entice you to buy. Understanding this concept will protect your wallet even if you need to get a few things this holiday. Families report purchasing new clothing, shoes, and other treats specifically for this time. Also, since many of these items are so holiday specific, once it’s over, they will not be used again. It’s enough to make you reconsider the way you shop for Easter and other occasions. Here are 5 quick tips to celebrate in style, without all of the costs. 1. Be selective about gifts – While you may want to purchase lavish Easter baskets, limiting it to 3 items will save a bundle. You’ll still provide the sentiment without breaking the bank. 2. DIY your crafts – Think simple and natural when creating wreaths and decorations. Empty egg shells leftover from breakfast are beautiful, fit the theme, and cheap. 3. Shop second-hand – Consider second-hand clothing for Easter. Most of the materials are worn only for the holiday before they are consigned or donated. 4. Throw a potluck party – This will cut the costs on food when you’re hosting the event. Traditionally, you will supply the main ham, or chicken, but your guests can do the rest. 5. Shop discounted goodies for next year – Sales start the day after Easter. Usually at 75-90% off. Grab a few non-perishable goodies and hold them for next year. 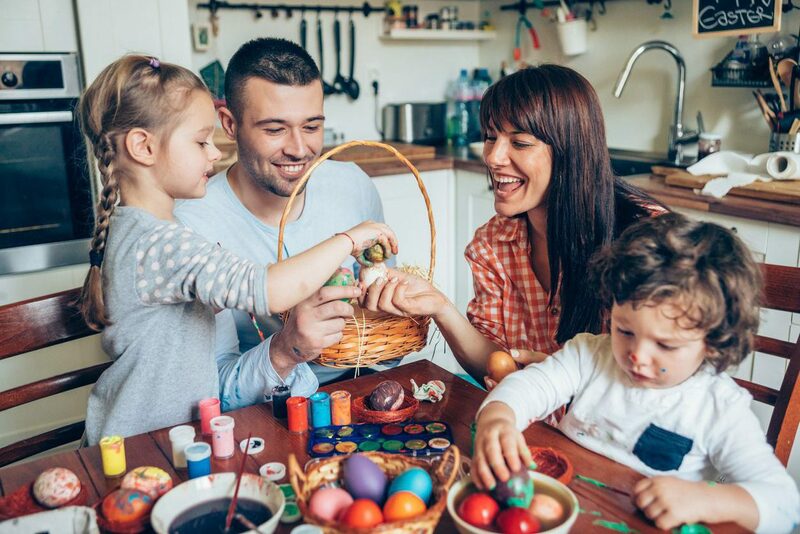 It’s true, Easter baskets and financial responsibility go hand in hand. If you want to save money on Easter, you have to plan ahead, limit your gifting, and shop for discounts. We hope by using the tips above, you can enjoy more “Eggcellence” this holiday. To you and your family, happy celebrating.